Our most inclusive working dog program, the Police K9 Trainer / Instructor Program combines all aspects of both our Protection and Detection Trainer programs, and emphasizes tasks Police K9s and their partners are called to do. Our training facilities provide realistic scenarios for working K9s, trainers and handlers, so dogs and handlers graduate ready to get to work. This program is ideal for current and former Law Enforcement Personnel, K9 unit supervisors and handlers, military, as well as for civilians who are interested in training and handling K9s for this fascinating line of work. Students who attend our 12-week program receive a solid foundation in dog behavior, learning theory, training tools, and behavior modification techniques. This foundation allows our Police K9 trainers to communicate effectively with their partners, build a solid relationship with their dog, and accurately troubleshoot any training or behavioral problems the dog may develop throughout its working career. Highland Canine Training, LLC is a global leader in Police and Military Working dog sales and training. Our Police K9 Trainer / Instructor Course teaches students what they need to know to be leaders in the Police & Military K9 industry. Our program will teach you how to effectively work with dogs of all types. Graduates of our program are confident in their skills, and most importantly, confident in training K9 teams. 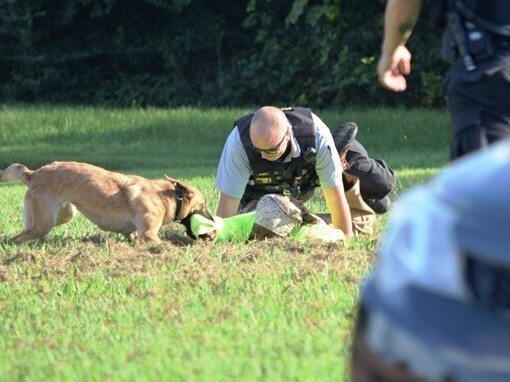 They learn to trust their police K9 implicitly because they are part of the entire learning process, and know the training methods taught at Highland Canine are proven to be successful in the field. Our 6-week Advanced Police K9 Trainer Course begins in the middle of our 12-week programs and targets the information geared toward individuals with more experience. 6-week Police K9 Trainer Course. Price includes deposit and program materials. Optional student housing is additional. 8-week Police K9 Trainer Course. Price includes deposit and program materials. Optional student housing is additional. 12-week Police K9 Trainer Course. Price includes deposit and program materials. Optional student housing is additional. Our Police K9 Trainer courses teach graduates various methods of training detection dogs and effectively training handlers to create successful K9 teams. Through years of experience and research, we have been able to develop some of the best detection dogs in the industry and as a student in our program, you will have the opportunity to understand and apply these proven techniques. At Highland Canine Training, LLC we continuously engage in research and development programs pertaining to military and working dogs and this knowledge and information allows us to develop cutting edge training programs. As a student of our programs, you will have the opportunity to be involved in any ongoing projects as well as being able to benefit from our previous research. We also focus on teaching fundamental police patrol dog techniques to obtain reliable behaviors for the life of the police dog. Our program teaches you how to utilize operant conditioning and successive approximations to build behaviors such as the “out” and “recall” as well as solid obedience with police patrol dogs. Our Police K9 Trainer Courses also emphasize the importance of scenario-based training and certification in creating effective police K9 teams. Our courses teach students how to develop effective police K9 training programs that mimic real-world field activities that challenge police dogs and their handler and create successful Police K9 teams. Our Police K9 Trainer Course also gives the student an in-depth look into the effective supervision and management of police K9 teams. From record keeping and report writing to K9 courtroom survival training and exercises, this course gives you all the information and hands-on experience to be an effective police K9 supervisor. Shorter programs are designed for those who already possess a solid understanding of canine behavior and have a strong background in professional Police K9 training or handling who are looking to polish their skills. Our Police K9 Trainer Course offers you ample classroom training with an emphasis on hands-on experience. 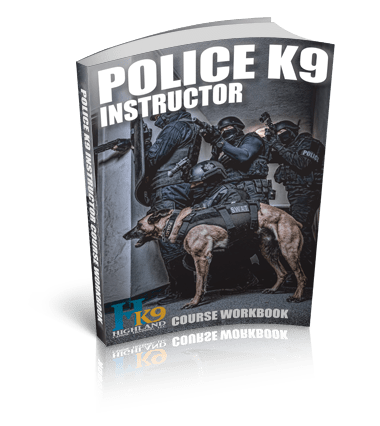 A Police K9 Instructor Course workbook is included in the price of the program and is yours to keep. Students are not required to purchase other books as part of the course. Yes! You can use your GI Bill and VA benefits for our 12-week Police K9 Trainer Course. Veterans and their family members are eligible. We offer simple and affordable financing options and can finance tuition for up to 48 months with low monthly payments. Only our 6-week Advanced Police K9 Trainer Course requires considerable working experience in the field. Our Police K9 Trainer Course is popular among graduates because it gives them the knowledge they want that is taught by expert instructors with relevant operational experience. 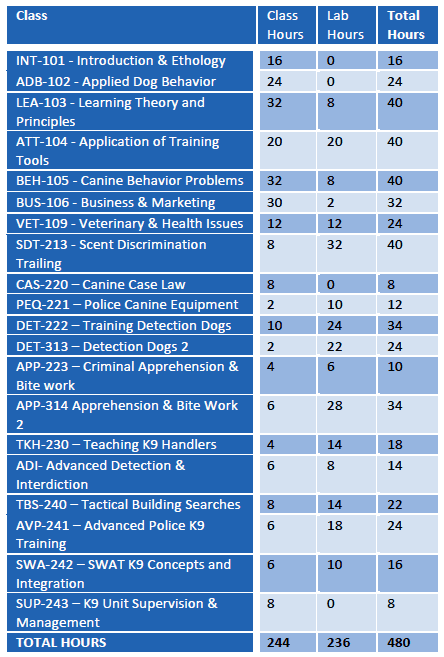 Below is a brief outline for the Police K9 Trainer / Instructor Program. This outline does not cover all of the material, lectures, discussions and hands-on application that is covered during the program and is provided to give a general idea of the material covered during the program. Practical application evaluations and written examinations occur following each week’s instruction.